An 84-year-old man with a 180-pack-year smoking history presented with a two-month history of skin lesions on his hands, feet, ears and nose. The cutaneous lesions were painful and well delimited. Eight weeks’ treatment with clobetasol cream had been unsuccessful. The patient also reported dysphagia, odynophagia and weight loss (8 kg in three months). We characterized his skin lesions as symmetric hyperkeratotic plaques involving the distal part of his hands and feet (Figure 1). He had yellow fingernails, which were proximally detached. His ears and nose had violaceous desquamation (Figure 2). Computed tomography showed a mass in the right parapharyngeal space and enlarged cervical lymph nodes on the right side. Microscopic examination of fine-needle aspiration of the mass was consistent with a diagnosis of poorly differentiated laryngeal squamous cell carcinoma (tumour stage 4a, lymph node stage 2c, no distant metastasis). We diagnosed his skin condition as a paraneoplastic condition known as Bazex syndrome, based on the new onset of typical skin findings associated with the tumour. This diagnosis was confirmed when the skin lesions resolved after three weeks of radiation therapy to the mass.1 There was no recurrence of skin lesions at six-month follow-up. Symmetric hyperkeratotic plaques on the distal part of the hands and feet of an 84-year-old man. 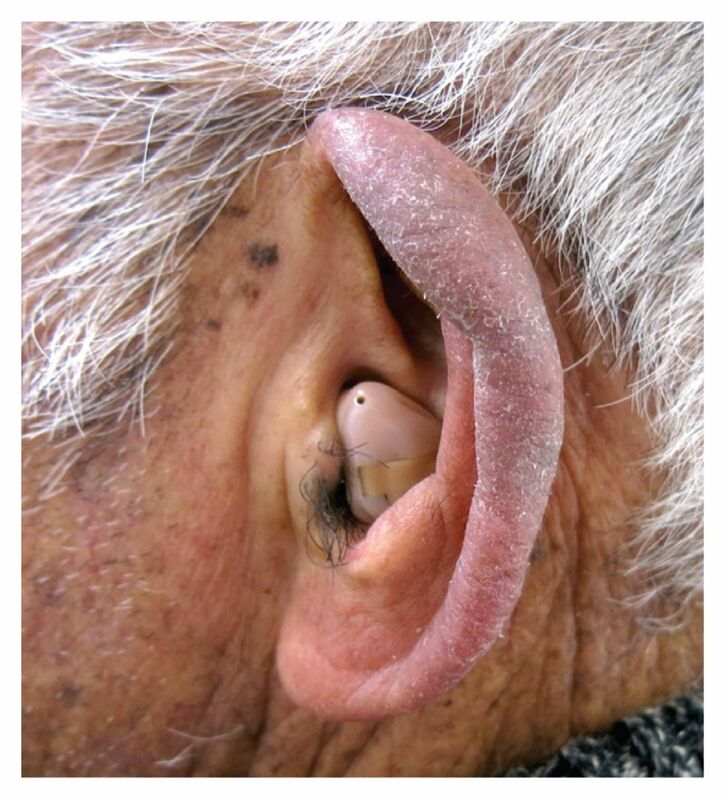 Violaceous desquamation of the patient’s ears (hearing aid in place).
. Paraneoplastic cutaneous manifestations: concepts and updates. An Bras Dermatol 2013;88:9–22.
. Acrokeratosis paraneoplastica in serous ovarian carcinoma: case report. BMC Cancer 2015;15:507.